An armada of air, sea andspace intelligence assets are being deployed above and around North Korea inanticipation of the imminent test of a 105 ft. Taeop-Dong 2 IntercontinentalBallistic Missile disguised as a satellite launch vehicle. The timing of the test isunknown, but expected soon. Key North Korean support hardware has been spottedmoving into place around the launch site and North Korean leader Kim Jong-Ilvisited the launch facility February 25. Iranian hardware, includingpossible satellite components, are part of the North Korean test. Many of thesame flight test objectives for demonstrating ICBM flight and guidance can beduplicated with a space launch, where the velocity of the upper stage isallowed to reach 17,500 mph. Obama adminstrationofficials say any kind of test will immediately result in strong new sanctionsagainst the North. "I am worried aboutthe threatened North Korean test," Rep. Jane Harmon (D-CA) chairman of thehomeland security subcommittee on intelligence and risk assessment, said in WashingtonFebruary 24. "This is very serious so it is important that theadministration pay keen attention to the region," she said in an NBCinterview. This illustrates thenecessity of monitoring how North Korea and Iran act in tandem, as well asindividually where such critical weapons developments are involved. As an added caution,elements of the still embryonic U.S. Missile Defense System have been activatedand turned over to U.S. Strategic Command for possible use during the NorthKorean test. These include assets suchas the massive Cobra Dane radar in Alaska, a large X-band radar in Japan, afloating X-band off Hawaii and Aegis Surveillance and Tracking destroyers inthe waters off North Korea. There are also Aegis"engagement" cruisers and destroyers with Standardmissile interceptors at strategic points along the most likely groundtracks. And should the flight move onto a trajectory hostile to the U.S. orJapan, the North Korean vehicle could be shot down by an Aegis ship. U.S. Navy crews are beingtrained up on potential real life scenarios to be ready for what ever NorthKorea does. "North Korea hassuccessfully launched [large] missiles in the past but the third stage hasnever been successful," says Harmon. "Once they are successful with athird stage they would have a missile that could reach the western U.S. This isvery serious and so it is critical that this administration play keen attentionto this test activity. "This combined with anadvanced missile industry and a nuclear bomb making capability, forms a NorthKorean recipe that is truly scary," Harmon said. "And intelligence isthe key to figuring it all out." Rarely have so manymilitary space intelligence capabilities been brought to bear on what NorthKorea is up to. With the Kim regime teetering the test could be the triggerpoint major leadership shifts in the country. "We are watchingclosely with all the assets we have," says Marine Maj. Bradley Gordon ofthe U.S. Pacific Command. "We have all sorts of sensors deployed aroundthe area." These assets, linked withcontrol centers, can maximize the U.S. and Japanese intelligence gained fromthe flight when it occurs. Air and space basedintelligence assets include continuous electronic intelligence patrols byadvanced U-2 aircraft flying at 70,000 ft. and EC-135 Rivet Joint type aircraftflying lower with the hope of capturing North Korean voice transmissions,specifically involved with leadership discussions and decision making regardingthe launch including the countdown. Special optically equipped C-135 and P-3aircraft are in the area to image the climbing vehicle when it does lift off. It is possible the NorthKoreans could launch smaller rockets to temporarily distract American assets.This was done in July, 2006 when the Koreans were able to "penetrateseams" in U.S. intelligence capability. Defense officials say measureshave been taken to avoid a repeat of that shortfall. In space, three or fourAdvanced KH-11 optical and infrared spacecraft pass over the launch site aboutfour times a day and four times at night, while imaging birds from Japan andEurope do the same. Major U.S. Lacrosse radarimaging satellites watch the site at night, as do new European and Japaneseradar spacecraft aided by powerful change detection software that cancharacterize differences in activity over a few hours. Further out, two or threeU.S. Air Force Defense Support Program (DSP) infrared scanning missile warningsatellite continually watch the area for the flash that would signify a launch.They are now also aided by two Space Based Infrared Highly Elliptical payloadsthat could provide more advanced data on the climbing North Korean launcher. With all of these assetsworking to characterize the North Korean launch, the U.S. will have the datanecessary to decide whether to shoot it down should the long range Taeop-Dong 2ballistic missile deviate from a space launch trajectory toward a ballisticpath toward Japan or Alaska or Hawaii. Although U.S. and Japanesemilitary commanders have practiced that scenario, U.S. analysts doubt that willbe the case. But at the least the test will provide useful experience onAmerican command and control, courtesy of Pyongyang. The U.S. and Japaneseresponse will also "send a message" to the Hermit Kingdom that theU.S. takes nothing for granted in dealing with the teetering government of theailing Kim Jong-Il. Analysts believe thevehicle will eventually be capable of delivering a small nuclear weapon and iscapable now of delivering a biological payload as a terror weapon. The 105 ft. two stageconfiguration of the Taeop-Dong 2 has a range of 10,000 km. (6,200 mi.) and thethree stage version has 15,000 km. range (9,315 mi.) The two stage versioncould also launch a 300-500 lb. class satellite. On February 25, Kim, stillfrail from a stroke, visited the Musudan-niLaunch Facility that sits along the rugged central North Korean coastfacing the Sea of Japan. It is the same site used for a failedtest in July 2006 when the vehicle nose shroud separated to earlydestroying the vehicle. 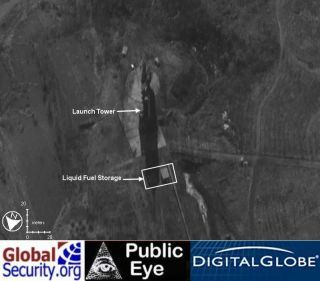 "New imagery taken onFebruary 17, 2009 provided by DigitalGlobe, shows increased activity at theMusudan-ri launch site," says DigitalGlobe. The new launch center atTongh'ang dong on the northern west coast is not complete and so the launchsite at Musudan-ri is being prepared for one more launch. The imagery was takenduring the visit of Secretary of State Hillary Clinton to China and South Koreawhere she outright confirmed that intelligence showed test preparations areunderway, saying any flight would be "unhelpful" to the lessoning oftensions on the Korean Peninsula. An analysis of the site wasperformed with the aid of GlobalSecurity.Org. Imagery obtained at 60 cm. (2 ft.) resolution by the DigitalGlobe Quickbird satellite shows the facilityto be equipped with a modern and enlarged horizontal processing facility, largestatic engine test stand, and launch pad itself. Although not the type offacility the North would used as an operational war fighting base, there areindications the North Koreans are constructing such facilities for thatelsewhere. Other intelligence assistshave found what appear to be hardened silos for vertical launch ICBM or IRBMSunder construction elsewhere in the country.